Let’s get kids moving! 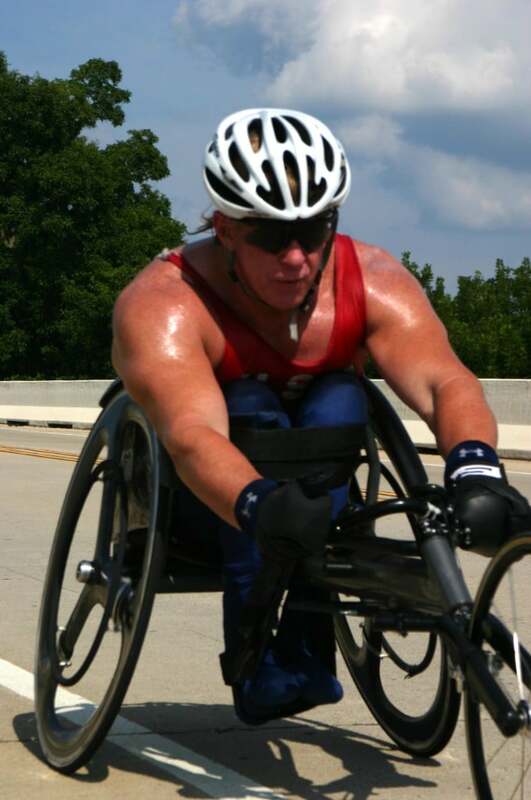 I am pushing my racing wheelchair 47 miles from Hope, AR to Texarkana to do just that! NEW YORK, NY (CNN) – We all know exercise is good for the heart and preventing cardiovascular disease, even in children. But what kind of exercise is the most beneficial? BIG PUSH Brochure - covers Kevin route and has all the facts about 17% of nation's youth is obesity and two thirds is over weight and Kevin is going to push his racing wheelchair 2,500 miles to promote fitness activities & good healthy nutritionally balanced meals & healthy snacks on the BIG PUSH across America! We all know it’s healthy to get moving, but which movement is best for the heart, especially when it comes to children? A new study published in the American Journal of Human Biology finds that high intensity exercise, such as fast sprints, is more beneficial for kids, than traditional endurance training, such as long distance running. Researchers at the University of the West of Scotland recruited a group of volunteer school children, forty seven boys and ten girls, and randomly divided them into moderate and high intensity exercise groups. The high intensity group’s training consisted of a series of 20 meter sprints over 30 seconds, the moderate exercise group ran steadily for a period of 20 minutes. Study results showed that both groups cut their cardiovascular disease risk factors, such as lowering blood pressure, dropping sugar levels and losing weight. Researchers say the results demonstrate that brief, intense exercise is a time efficient way to improve heart health in adolescents. 11 AM – We went on to Hope, AR to pick up miles we missed yesterday and also to visit Bill Clinton’s childhood home. 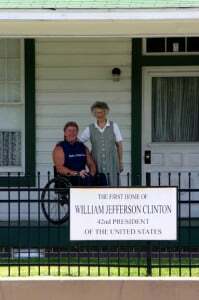 We went on a tour guide with Ms. Louise who took me on a tour of former President Bill Clinton’s home. I left her a copy of my book, There’s Always a Way and a copy for Joe McNiel a young man from her church that was also paralyzed. Joe was also getting into wheelchair athletics, but was having some problems and challenges so I helped give him some tips to help him do better. I left Louise with some brochures to hand out to people including Joe and I hope that he would be inspired by it as well. *Note* Andy had a flat tire for the past two days. We stopped at a bike shop near Arkadelphia to get the tire repaired, but the tire blew again. We were unable to find a tube that would fit Andy’s bike so he was unable to get many pushing pictures. 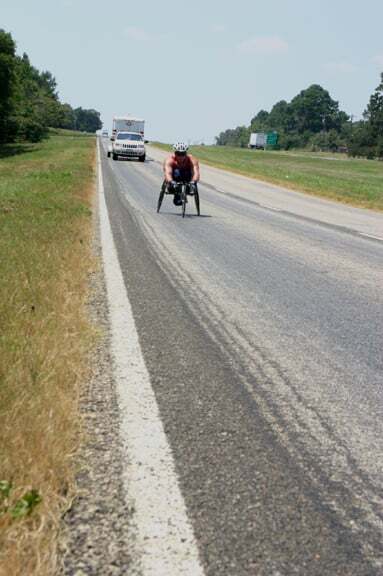 Kevin cruising at 35MPH down the rolling hills from Hope, Arkansas to Texarkana, Texas 47 miles of pushing for the day! 1 PM – I pushed to make up my miles from Hope to through Texarkana. It was a total of 47 miles and took just over 4 hours. I pushed around some in Texarkana, AR & TX. Almost made the 50 mile a day average we figured I would have to keep to stay on schedule. Kevin raises his arms in Victory in two states at one time. As you can see by the sign he has one arm in Arkansas and one in Texas on the - BIG PUSH! 4:30 PM – We got back in the Jeep and drove closer to the Texas state line and at the Texas/Arkansas state line at the US post office to take pictures. 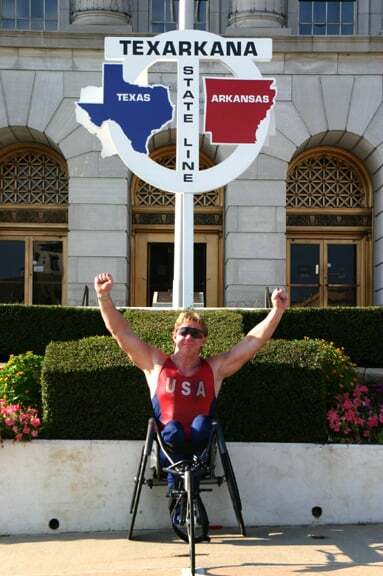 I had my arms raised in victory for proper health and fitness for two states, one arm was held high in Texas and the other arm was raised in Arkansas. Then I pushed over to the Texas state line and had my picture taken as I pushed over the line. 6 PM – We went back to one of our BIG PUSH sponsors the Baymont hotel and took a break for a healthy balanced meal. I ate mine the proportions the dieticians for extreme athletes had given me which was 60% good carbohydrates 30% lean protein and 10% good fats from natural food sources. To the left is the logo for the "Fitness 4 ALL 50 State Tour" to the right is the back side of the Medallion which was made for the "Fitness 4 All 50 State Tour". These will be given to the girl & boy in every school we visit who serve as an example of doing their very best to eat good healthy balanced nutritional meals or healthy snacks and are doing 30 to 60 minutes of exercise. That inspires their peers to get fit! 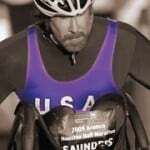 You can see more of what we have done on the BIG PUSH pushing over 2,500 Miles across America in my racing wheelchair to help promote Fitness activities and proper nutrition for everyone, one community at a time. I founded the “Fitness 4 All 50 State Tour” nonprofit 501-c-3 dedicated to educate our nation’s youth, parents, teachers, administrators and the American people about the importance of staying active and making healthy choices for balanced nutritional meals or healthy snacks and do a better job letting people know about the tour –you can see many posts on my blog at: www.KevinSaunders.com/blog Then choose on the right side of the page the Fitness 4 All 50 State Tour in red. I am trying to let everyone see what my team and I are doing for the – Fitness 4 All 50 State Tour- and what my partners like the top fitness and nutritional partners are doing as well in America. We want to share with you what they are doing to help reduce obesity and overweight kids in schools across America. Also how you can find this information on LlinkedIn and other Social sites. Right now it posts in WordPress here in Revolutions my blog on my website at www.KevinSaunders.com I know the BIG PUSH – & – Fitness 4 ALL 50 State Tour – is a worthy cause because it will give kids the education & knowledge they will need to help them understand the why, what, when and where would be the smartest choice for fitness activities and getting balanced nutritional healthy meals or snacks. Knowledge is power and NO ONE likes getting taken, right! . Here is a link to what the Cooper Institute is doing http://www.cooperinstitute.org/ So that this current generation stays fit and it is just a normal day to do a fitness work out and pick something really healthy to eat. When people don’t do that then that’s not normal for them, they want to get back on track like an elite athlete would to stay on pace for the GOLD! That is just what the goal of massive – Fitness 4 All 50 State Tour- a nonprofit organization 501-c-3. Our mission with the “Fitness 4 All 50 State Tour” a nonprofit organization 501-(c) (3) is to serve as a catalyst to educate and empower our nation’s youth grades 3-12, parents, teachers, administrators, city mayors, community leaders and state governors and state leaders and Americans to empower them to become self- motivated to utilize the tools, resources and “My Healthy Daily Lifestyle Journals” to make daily educated healthy decisions so making healthier lifestyle choices becomes a way of life. Our purpose is to educate our nation’s youth, parents, teachers, administrators and the American people about the positive effects of physical fitness and proper nutrition, in such way that they are inspired to actively make healthier choices on a daily basis for a lifetime. We have partnered with the top fitness and nutritional people in America to accomplish this. Our goal is to cover all 50 states giving approximately 4,000 presentations to the schools grades 3 – 12 and approximately 4,000 presentations to city and state officials and leaders. For the school’s students and other Americans that follow the tour through the media and the schools and city and state governments and leaders we give presentations too. We want them to be able to download all this information from the top fitness experts, top trainers, aerobic experts such as Dr. Cooper and the Cooper Institute has partnered with us. They have invented the NutriGram® and Fitness Gram® We also partnered with top nutritional and Fitness experts so our nation’s youth, teachers, parents, administrators and Americans can download this information to their computer, Mp3 Player, iPhone, iPad etc. Kevin Saunders – www.KevinSaunders.com – is about what I have done and do as a one of the top motivational speakers, safety speakers, school speaker, university & college speaking. I also speak to organizations, non-profit groups and I am a Speaker for Overcoming Adversity. www.KevinSaunders.com/blog – Is covering the- BIG PUSH – the prelude to the “Fitness 4 All 50 State Tour” a nonprofit 501-c-3 dedicated to providing the best education for Fitness and Nutritional Information to our nation’s youth, parents, teachers, administrators, city and state government leaders and community and state leaders and Americans so empower them to become self- motivated to utilize the tools, resources and “My Healthy Daily Lifestyle Journals” to make daily educated healthy decisions so making healthier lifestyle choices becomes a way of life. The "BIG PUSH" brochure tells about the 2,500 mile push across America, giving presentations, media interviews and it also has facts about the 17% of school kids are obese and two thirds are over weight. ...children are increasingly exposed to genetic and environmental 'triggers' that can lead to obesity and possibly diabetes according to the American Academy of Pediatrics. So we must take the fight to the streets and highways across America one community at a time to all 50 States! The ‘Big Push Across America Tour’ and the ‘Fitness 4 All 50 State Tour’ is designed to promote proper fitness and nutrition to the American people, but more specifically youth, parents, teachers, community leaders, and city and state officials. I do my best to keep up with the latest news on fitness, health, exercise and nutrition. So today during my daily web search I came across this interesting article from CNN on what researchers say is the best exercise for kids. Here is the article, let me know your opinion.